The source is available on Github: https://github.com/jweigend/JEEAngularCRUD. It contains the customer list, detail, update and delete functionality. 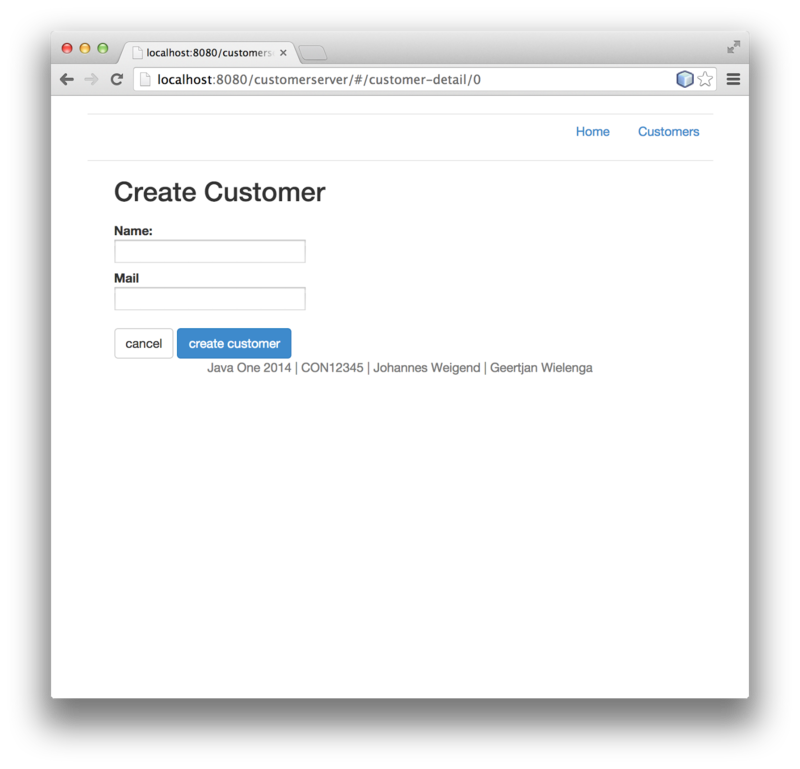 It is a simple CRUD Singlepage HTML5 Application developed with NetBeans 8, Glassfish 4.1 and AngularJS. We use a JEE REST Server Backend and a HTML/JS Frontend. The HTML Frontend communicates with REST Services. The Server is stateless. Finally everything was put together in a single Deployment Unit by adding the HTML5 Application as a Maven Resource using the Maven WAR-Plugin. Use the „Create REST Services from Database“ Wizard to create REST Services direct by connecting to the sample database and choose the Customer table to generate your services. Create a „Cross Origin Resource Sharing Filter (CORS)“ in NetBeans to make sure the external HTML5 app can access our Webservice (After step 3 - the filter could be later removed for production). Thats all. Amazing. Thats a perfect starting point for rapid prototyping. Since most enterprises have JEE Application Servers this Application will also meet enterprise requirements. Now we are ready to develop the HTML5 Client. Use the yo angular generator to generate a Angular HTML5 application. Prerequisite: Make sure Yeoman is installed. After successful generation you can use grunt to show the generated sources in your browser. „grunt serve“ starts a simple NodeJS server which is a good first test. We are ready to open the generated project in NetBeans. We use the „HTML Project from existing sources“ type of project. The NetBeans project has some errors because the generated structure is not direct supported. The problem here is that the downloaded bower dependencies are one directory lower than the index.html file. This is currently not supported by the Netbeans toolchain. We can fix this easily be changing the directory in the .bowerrc file from bower-components to app/bower-components. After successful editing of the bower component file we kann download the bower libraries by clicking „bower install“ direct to the app directory in the project tree. Now we have professional template for our project. The template uses Grunt as build automation tool. It uses bower as library download tool. It has the standard angular structure with unit tests and integration tests. We now want to have two views. 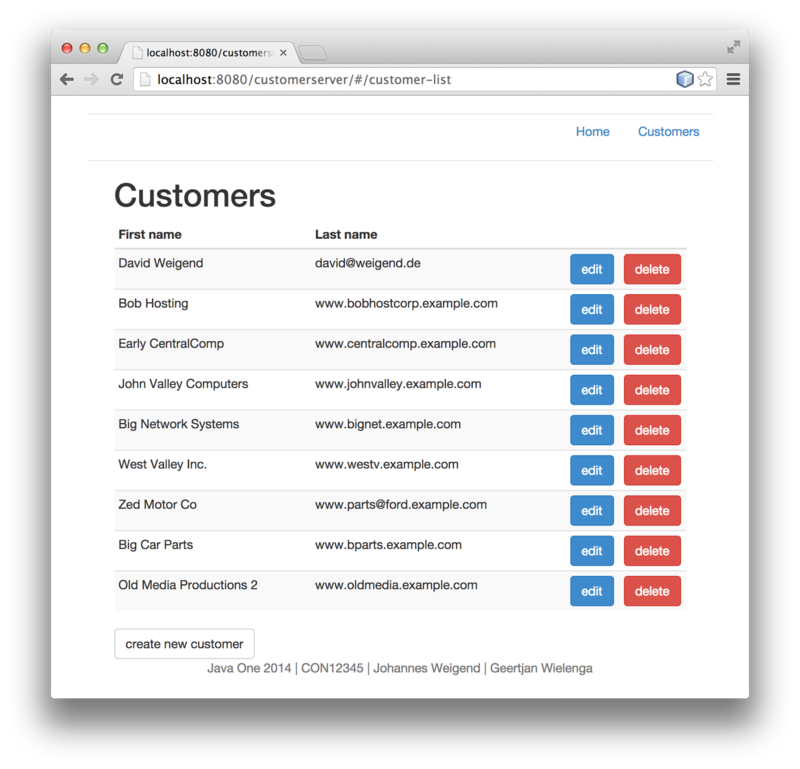 A list view to display the list of customers. A detail view to update or create a single customer. With the Yeoman generator we can create the two views inclusive the corresponding controllers. The reference to the controller code is automatically added to the index.html page. To make a first test we edit customer-list.html to loop over the generated array in the controller. We change the awesomeThings array of string to an array of customer objects which contains a name and an email property. Now we are ready to connect the UI with our REST service. First create a customer-svc factory. 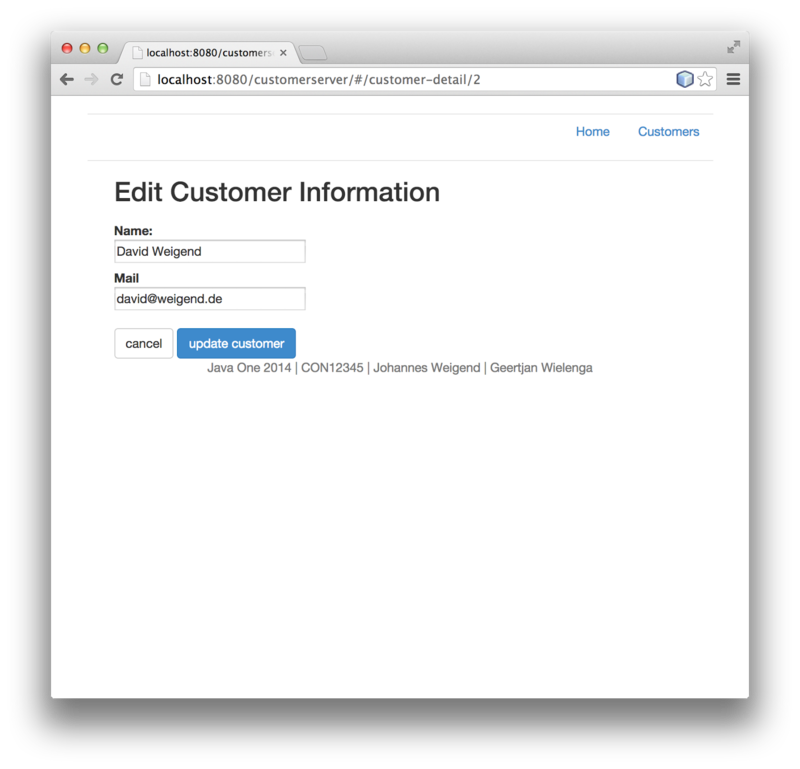 We have to change the generated customer-svc.js file to return a angular resource object to access our webservice. We also have to add the new module „customerServices“ to our list of module dependencies of our application. Otherwise the module will not be accessible in our controller. We change now the customer list controller to use the Customer Service instead of an hard coded array. To create the Update/Create dialog nothing special is needed. If you have this running it should be easy to extend the example as you wish. Do you have source code in github.com or bitbucket.com this example ? how do i deploy the angular bit on glass fish with my java app?